It is clear that "Terms and Conditions" marks a significant turning point in Bellamy's arc, and in the Arkadia politics plot as a whole. The 100 Season 3 Episode 8 was a great episode, despite the fact that it only focused on a relatively small portion of the cast. It did a remarkable job of setting the scene for Clarke's impending return home. The 100 Photos from "Terms and Conditions"
Whereas The 100 Season 3 Episode 7 was all about Polis (and the Commander/Polaris origin flashbacks), this one pivoted the focus back to Arkadia. Clarke and Murphy were not seen, and Lexa's demise was not addressed. Apparently, news of Lexa's death had not yet reached Arkadia or the Grounder army of the twelve clans that she called to set up the blockade. I assume that either there must be some overlap between the events of "Thirteen" and the events of "Terms and Conditions," or maybe that Commander law dictates the death not be widely announced until after a replacement is chosen. Just a guess. Octavia and Indra, last seen headed back towards Arkadia with revenge on their minds, have also not made their way back yet. That's something to look forward to when the show returns... in several weeks (TOO LONG!). Let's just put this out there to start: Bellamy's arc has not been very well plotted so far. Yes, you can understand why he did what he did in teaming with Pike, but a lot of that understanding comes from very closely examining the character and making inferences, as opposed to what was actually shown onscreen. From what we've actually seen, sure, it seemed abrupt. And Gina was an obvious plot device (a bad one, at that). Bellamy's confrontation with Clarke did some great work in illuminating Bellamy's reasons for joining up with Pike and fiercely hating the Grounders, but his actions still felt a bit much for a character that has come so far in these three seasons. Luckily, Bob Morley knocks every bit of writing for his character out of the damn park, and he was particularly spectacular in "Terms and Conditions." He and Henry Ian Cusick as Kane utterly blew me away with their performances. Grounder: Choose the side that's best for your people. Bellamy: I do that every day. So far nothing has changed my mind. Permalink: I do that every day. In the opening scene, Hannah reported that a recon group had lost contact with Arkadia and two grounders arrived at Arkadia to explain the terms of Lexa's blockade (anyone who crosses is subject to a kill order) and to offer up the opportunity to swap Pike out in exchange for the lives lost. "FAIR DEAL!! TAKE IT!!" may have been shouted by me at my TV screen. Maybe. Bellamy gave them a thanks, but no thanks, and then shot them dead once they went on about the Sky People all dying slow deaths. That marked the first occurrence of the line of the night. When Bellamy is asked about making the right move for his people, he explained that he does that every day. By the time he echoed this line at the end, the context and significance had utterly changed. This was easily one of the most exciting installments of the season, or maybe even the series. There was so much intrigue, as the Kane group plotted against the Pike group, and the Pike group plotted right back. Again, I was disappointed to see Monty on the wrong side of things, but it does make sense that he'd throw in with his mother. We were also finally given some context for why Hannah has such unwavering allegiance to Pike. Monty, being down here I've learned that if something helps you survive, it's always the right thing. Pike taught me that. He taught all of us. It's what kept us alive. You do what it takes. Hannah's speech to Monty was basically a reiteration of a major theme on this show. To oversimplify it: "Survival – but at what cost?" This is something the characters of The 100 have been struggling with since the series debuted; the shaky balance between surviving in the harsh world they've found themselves in, and maintaining their humanity/morality. We (mostly) disagree with Pike and Hannah and their actions, because their view is an extreme on one end of the spectrum ("do what needs to be done to protect their own, regardless of how harsh or cruel"). Kane was joined in his plotting by Harper and Miller, which was excellent to see. 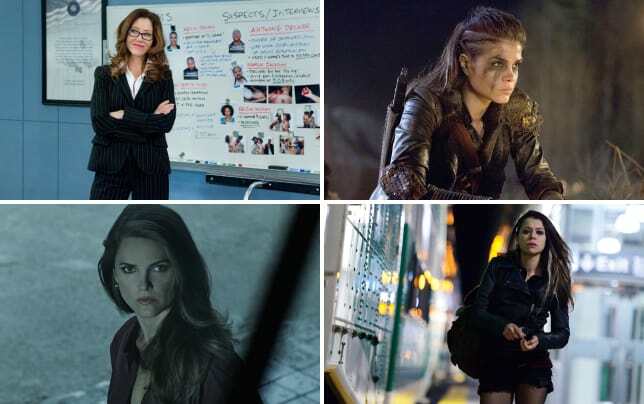 The 100 has no shortage of fantastic recurring characters but, unfortunately, in a cast this large, they usually don't get much focus (often even disappearing completely for long stretches at a time). Unfortunately, sometimes major characters disappear as well, at inopportune or inexplicable times – and their absence is glaring. Case in point: where on earth was ABBY while all of this was going down? She was not even mentioned, once. This seems like a Mount Weather-sized plot hole to me (too soon?). This time, not only did we see Harper and Miller, but they were actually of vital importance to the plot. Miller and Brian, his boyfriend, also had a very small subplot of their own, since they've found themselves on opposite sides of this Pike/Kane showdown. Brian is currently on my shitlist for having bugged his boyfriend's jacket, betraying his trust, but I guess on the bright side, he immediately regretted what he'd done. We don't know enough about Brian yet to understand why he's loyal to Pike over his boyfriend, but I assume his reasoning is similar to Hannah's (Pike led them through Ice Nation territory and kept them alive for months – things like that do create a bond that's hard to shake). As for Kane's plan itself – it was a good one, I'll give him that. The fact that Sinclair had purposely gotten himself locked up while enacting what we thought was the plan (to disable the rover that Pike was intending to turn into a weapon to bomb the crap out of the Grounder army), only to reveal that the real plan was to start a riot for a distraction, was an awesome twist. I'm a big fan of Sinclair, too, so it was great to see him actively involved. Not so great to see him getting shocked, obviously. Though that entire riot sequence was excellently choreographed and acted. Kane's character has been so well developed since The 100 Season 1. It is significant and important to recall that Pike is essentially an exaggerated (VERY exaggerated) version of Kane's own Season 1 philosophy. Remember how hard he pushed to execute those people, to conserve oxygen? Survival at all costs, then. 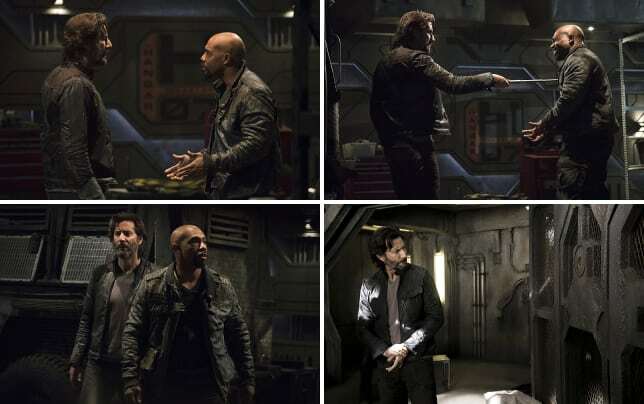 Over the course of time, Kane changed, thanks to his experiences with the Grounders (and his great friendship with Indra, in particular). It was so perfectly in character that Kane, despite all Pike had already done, repeatedly attempted to reason with him throughout "Terms and Conditions," until, finally, Pike "made [him] do this" (shocking Pike and carting him off to the Grounders, to be exchanged for peace – something he had insisted to Harper that they would not do earlier on). Kane: When this ends with our camp in ruins, you won't be able to say no one told you there was a better way out. Pike: No, when this ends with Arkadia victorious, you'll only have yourself to blame for choosing the wrong side. There were just so many phenomenal dialogue exchanges, you should check them out at The 100 Season 3 Quotes. Kane tried to reason with Bellamy as well. They began to develop a bond back in The 100 Season 2, and it was clear that their bond had deepened further over the three months between The 100 Season 2 Finale and The 100 Season 3 Premiere, as they worked together in positions of power. It was actually painful to watch Kane practically plead with Bellamy to see the light and join his mission against Pike, only to get turned down. And since we're talking about painful: Bellamy standing in front of Kane's rover to stop him from taking Pike and later Bellamy's reaction to Kane's death sentence were two of the most emotionally wrought and well-acted scenes in the series. Kane: I admire your adherence to the rule of law. I really do. But these are times when we have to look beyond the rules. To realize they were established to serve a world of the past. Not of the future. I beg you, one last time, to see the world as it is, not as it was or as you want it to be. Kane: And I hope you believe that if I thought for one minute that turning myself over to the enemy would secure the safety of our people, I would do it. But only a deluded man would believe that. And only a guilty man would try and tell him so. 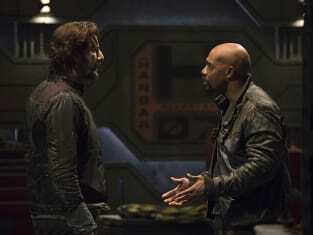 Marcus Kane, for the crimes of treason, kidnapping, and attempted murder, I hereby sentence you to death. Take him. I was actually stressed out watching them, though I feel very sure that Kane will not actually be executed; plot-wise and character-wise, there is still so much for him to do (kiss Abby as per the season promo, for example). Bob Morley's very subtle but strong performance during Bellamy's confrontation with Pike immediately after Pike issued the death sentence was the first indication that Bellamy had seen the light. Lying to Hannah about whether he and Monty had identified any of Kane's accomplices, in order to protect Harper and Miller, was the icing on the cake. Hannah: Let's hope today's actions make it clear to the people of Arkadia which side they should be on. It's not really that hard choosing what's best for your people, is it? Bellamy: No. I do it every day. Permalink: No. I do it every day. YES. Bellamy is back and making his way out of the Pike fog. Obviously, all is not forgiven and washed away, but his redemption arc needs to start somewhere and saving Kane from Pike by deposing Pike from the inside is where I'm banking on it starting. The other plot of note involved Raven and Jasper, who'd been recruited to assist in retrieving the ALIE chip-maker from Pike's office. This was also another fantastic set of scenes, with an incredible performance by Lindsey Morgan in particular. Raven's breakdown in realizing that she couldn't remember Finn at all – part shock, part fear, part very palpable "Oh no, what have I done?" – was amazingly scripted and amazingly played. It was maybe a little abrupt (I expected Raven to float around in faux-happiness a little longer), but that was my only (very minor) quibble with it. It's unclear what exactly was Jasper's intention in quizzing Raven about Finn all of a sudden – did he register, on some level, that something was off about her? Was he actively trying to jog her memory? Based on his reaction, it didn't seem that way, but hey, whatever, it worked. Raven, being a strong, kickass character, somehow snapped herself out of the ALIE-haze – something ALIE had never seen before. Naturally, Jaha and ALIE aren't just going to give up on their plan. While everyone at Arkadia is distracted with politics, Jaha is plotting his next move. Will Raven (and probably Jasper, now) be able to counter him? The song at the end was "Remains" by Algiers. I absolutely loved it (and the entire scene accompanying it), so I wanted to share that knowledge with y'all. One more time, for the readers in the back: Seriously, WHERE was Abby throughout all of this? Ridiculous oversight in not even mentioning a reason for her absence in dialogue. It was a little bit weird that we saw the events that occurred at Polis during the "Previously on..." and yet they left out Lexa's death.... What? Pike is already the worst, but is now doubly the worst for having (ERRONEOUSLY) blamed Kane for Finn's death. Finn quite clearly gave himself up, and Kane had no say in it. What a jerk thing to say. I really, really thought that Lincoln would be killed in that riot scene. Shocked that he wasn't, but still pretty sure he's on borrowed time. Glad that Miller and his boyfriend finally kissed, and kudos to the commenter of two weeks back who pointed out that the weird hug they did then in lieu of a kiss may have been indicative of friction between them. Totally called it! What did you think of "Terms and Conditions"? Let us know by commenting below and watch The 100 online here at TV Fanatic! Grounder: An army has fallen. Blood soaking the earth where he took their lives one by one. Bellamy: Welcome to the war against Skaikru. Permalink: Welcome to the war against Skaikru. The 100 Round Table: Is Bellamy Too Far Gone?